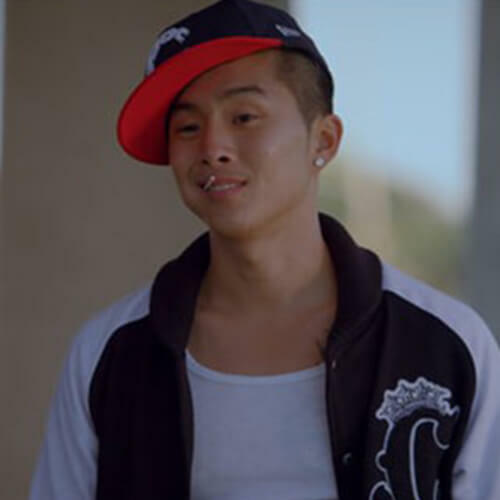 Justin Chon is known worldwide by audiences for his role as Eric Yorkie in the films TWILIGHT, THE TWILIGHT SAGA: NEW MOON, THE TWILIGHT SAGA: ECLIPSE and THE TWILIGHT SAGA: BREAKING DAWN. Chon’s other film credits include REVENGE OF THE GREEN DRAGONS opposite Ray Liotta and Executive produced by Martin Scorsese, 21 AND OVER, and MAN-UP, a film he wrote, produced and starred in. Chon also has starring roles in DETENTION OF THE DEAD, HANG LOOSE, ROCK JOCKS, INNOCENT BLOOD and in the dramatic festival short, JIN. Other film credits include the Wayne Kramer film CROSSING OVER in which he had a supporting role opposite Harrison Ford, Ray Liotta, and Ashley Judd, BALLS OUT: THE GARY HOUSEMAN STORY opposite Sean William Scott, the comedy/horror film, HACK. TV fans remember Chon as a series regular on Nickelodeon’s JUST JORDAN, and from the Disney Channel as one of the stars of WENDY WU: HOMECOMING WARRIOR. Chon’s most recent television credits include guest-starring roles on HOUSE M.D. and NEW GIRL. Chon was born and raised in Southern California.